I had these grand plans and posts all ready to go (in my head, of course) and then the reality of life came crashing down. My husband was in a serious cycling accident. How it happened is actually a funny story, but his injuries are no laughing matter. After an unexpected phone call from paramedics and an evening spent in the ER, he came home with a fractured skull at his neck, a concussion, many bad scrapes, torn ligaments and serious whiplash. That was 3 weeks ago. He is slowly on the mend but it sure makes you realize how lucky he and we are! All that has my mind reeling which meanrs projects and intentions went by the wayside. And my poor elderly dog, he is hanging on at 13.5 years, but is starting to really, really slow down. Every day I wonder if it will be our last with him. He is a chocolate lab and has been full of life, until recently. So with a vet's guidance he is taking medication to help ease his arthritic pain. He still get excited to eat and run in the woods, so we know he isn't ready to go. I have done a few little projects recently, one at my sister's place thanks to CIL Paints, but we have yet to put finishing touches on the rooms to have them ready to be photographed. We are both teachers and both work and raise families, which leaves little time for creative pursuits. AND with my hubby's recent accident, I just ran out of oomph. Hope I can share the makeovers on two rooms in her house soon! So....I am just popping in to say hi! $100 Home Depot Card Winner! 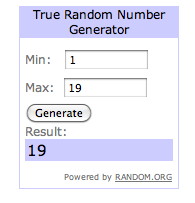 I have drawn our lucky winner for a $100 Home Depot gift card to spend in any Home Depot in CANADA. I apologize for not getting to this earlier but we have a family medical emergency late last week and my weekend was full of kids' events and nursing the hubs. Kathryn - I hope you can put that $100 to good use! Eco Friendly: Lighting & $100 Home Depot GC Giveaway! With Earth Day approaching, I thought it would be helpful to shed some light on how we can be more eco-friendly in the home. I have to admit that at our house we try to be eco-friendly but some areas of the house could use an eco-boost! Not only is being eco-friendly good for the environment but also good for the pocket book. I have teamed up with BC Hydro Power Smart and Energy Star lighting to share with you some fabulous ways you CUT your energy costs simply by switching out your standard run-of-the-mill lightbulb with Energy Star bulbs. Now if you live in BC, Energy Star lightbulbs are on SALE for the month of April!!! Read this to find out where. Did you know that 19% of the average household electric costs are due to lighting? You can cut that down simply by changing the the kind of lightbulb you use. Gone are the days of the horrid blue light of LED bulbs - you can now get LED bulbs that cast a warm glow. Not only can they cut your energy costs but they last longer than the average light bulb too - I know because I have been in my home for 5 years and some of the LED bulbs that we put in when we moved in have not been changed! Less energy used + long life = pennies saved! Just in case those packages baffle you, a little infographic to explain. Now you can stock up on Energy Star LED lightbulbs because BC Power Smart has given me a $100 Home Depot gift card to give away! Giveaway ends on Sunday, April 13, 2014 at midnight PST. Leave a comment below telling me what you do in your home to be eco-friendly! **You must have an email associated with your profile or leave your email in the comments. * I have not been compensated for this post. This is just something that I feel that we need to embrace in our home as well as yours!